A number of years ago, when I was sailing the Falmouth cutter, one night I ended up in the drink. It was about two in the morning and I had been anchored in back of the breakwater at Duck Island, on the south coast of Connecticut. The weather deteriorated and it wasn’t so nice out there, so I decided to go in to my regular slip in the nearby marina. It was raining, with a fairly stiff wind that wanted to blow the boat away from the float that I needed to tie up to in my short slip. (The photo above is that very boat and marina, but a slightly different slip.) Alone, and the docks of course deserted at that time, I made the tight turn to port, into the space between my float and the adjacent boat, and with dock line in hand took a rather long step from the starboard rail to the end of the float. Normally this would have worked, but the wooden float was slick in the rain, my foot slipped, and down I went, presumably with a splash. I say “presumably,” because I have a clear memory of coming up to the slip, stepping across, the grip under my foot letting go, and the very beginning of falling backwards toward the water. Then there’s a big blank spot, and my memory begins again when I am in the water, floating easily because of all the air trapped in my warm clothes and foulies. I had apparently had the presence of mind to keep holding onto the dock line, because it was, thankfully, in my hand. The docks at that marina are somewhat high, and I floated beside mine for a couple of moments, considering what to do next. It was obvious that I wasn’t going to be climbing right out of the water, so after a little thought along the lines of, “if there is ever a time when I really ought to inflate this lifejacket, that would be now, at two in the morning, in the dark and the wind, in the water.” The lifejacket inflated as it was supposed to, and before the boat could drift too far back I swam close enough to a cleat up on the float to be able to reach up and tie the line I’d been holding. As things went on, the boat drifted back to hang on that bow line, almost touching the boats on the dock across the way. Meanwhile, I was focused on the matter of how to get out of the water. For some reason it did not occur to me to try to use the emergency rope ladder on the boat (regularly used for swimming), so we still don’t know if, in a tremendous amount of rather wet clothing, it would have worked to climb that. It also didn’t occur to me to swim the fairly short distance from my slip over to the rocky shore, between the lines of boats. From there I could, at that time, have walked around back to the dock and the boat. I’m a good swimmer, and after all had the lifejacket inflated, but swimming to the shore simply didn’t cross my mind as an option. There’s some current that runs through there, so perhaps that was for the best. What I did think about was that the marina was full of people on their boats, probably sleeping. I was going to need help to get back up on that dock, and knew that at least some of the people I knew were within range. So I took out the little orange ACR whistle stashed in the lifejacket and gave it a try, with quite a number of pretty energetic toots. No response. That was all it took. Seconds later several friendly people were on the float, reaching to give me a hand. Together we figured out the best way to manage, and shortly I was out of the water. While that was happening somebody meanwhile had pulled the boat in and secured it to the proper cleats. As we all collected ourselves, I asked them if they had heard the whistle, and they said no, not at all. They had heard me hollering the names of my friends (who, sleeping in their cabin, never heard a thing), but attributed the yelling to the kind of rowdiness that sometimes goes with life in marinas. But the folks who heard these calls were awake, and dressed, and as soon as they understood the situation they were there in a flash. Nowadays I have “storm whistles” stashed all over the place, as well as the knowledge that in this sort of situation it’s not only okay, but crucial, to say very clearly that you need help. I hope to not land in the drink again – after that event I changed my docking system, to make stepping across unnecessary – but I sure did learn a lot from the experience, and the “basic facts” are just the beginning. The most remarkable thing is that it’s now about 12 years later, and I still have no memory of the actual time when I was falling. What I do remember is feeling terribly banged up afterwards. When you fall accidentally off a boat, particularly near docks, it’s not necessarily the ending up in the water that’s the problem. Rather, the biggest issue comes from what you hit on the way down. I was fortunate not to hit my head, but based on the pattern of bruises, I think that my left arm must have come down on something pretty hard. And I had that overall thrashed feeling, which I’ve only otherwise experienced after a major car accident. In the grand scheme of things, it’s not particularly important that I don’t remember that second or two of my life; the surrounding memories, and evidence, make what passed in those moments pretty clear. I’d like to know what I bashed on the way down, but the injuries are long healed, and it doesn’t really matter. What is more than relevant, however, is the illustration provided by this experience. As I’ve said before on this blog, I’m a survivor of quite severe childhood abuse. Most of this abuse I know about because of an odd kind of “shadow memory,” and because of the repercussions of those childhood experiences in my adult life. Just like those 1 to 2 seconds of falling from the boat, I have no regular, clear memory of many of the things that I know took place. And very much like being in the water after that fall, the outcomes of my childhood experience – the physical and emotional challenges of my adult life – point to how things got that way. The only difference is that a person floating in the water is so clear and unequivocal. As somebody pointed out to me (thank you, Lori) after the post from some time back titled “Thoughts on Rescue,” there is no lying in ocean rescue. Nobody thinks, “oh, the person I see in the water might be lying about it,” while the rescuer tries to decide whether or not they should fish them out; there is no evaluation of motives, or memories, or stories, nor is that question even relevant to the situation. Whether the person who needs help is in a life raft, or crawling through smoke in a burning building, the appropriate response is unequivocal. If it is physically possible, they are rescued. Even if the person doesn’t remember falling, it’s obvious that they are in the water, and people reach to help them back to dry ground. These days, I am fascinated, and comforted, by the relationship between memory, history, and the here-and-now. When I ask myself, “oh, did that old stuff really happen?”, all I have to do is look around at the surrounding present. When the surrounding present is just as incontrovertible as floating in that harbor, dock line in hand, you know that it’s true. Yes, discovering that there are good people who recognise you are in trouble and need help and give that help without any Grand Inquisition or Court of Blame is a soul-validating experience! I appreciate this post because you made me aware of the extraordinary and worth-validating gift that ordinary human response is for those (of us) who have lived too much without it. Hats off to you for making this connection and then for sharing it with the rest of us! Just keep in mind; you are the one who had the tale to tell to open the door to celebrating validation. You shone the light for me to see. 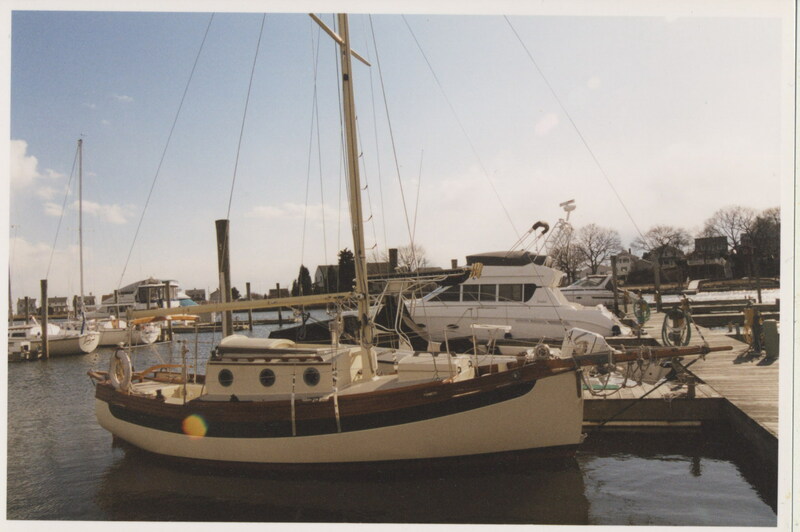 Another snowstorm here today: eager for my “yacht”, all 8 feet of her, to have her door accessible when the drifts melt! It took a few years to put it together, but since the lightbulb finally clicked on, it sure has been bright! And a fine yacht it is, your PD Racer. Looking forward to seeing it go on the water again. This summer is dedicated to moving, but maybe next year I’ll get to sail across Fundy, and come see in person – that would be a treat! I am putting my house on the market, moving at some unknown date. However, my email will remain the same and the welcome mat is always out – and use of bathroom/bathing facilities as well! I hear that cruising in both Passamaquoddy Bay (Eastport Maine & environs and in NB Deer Island & its uninhabited surrounding islets, Grand Manan Island, and the coast as far as St Andrews NB. Then cross over to NS, go through Digby Gut and up the Annapolis River to Annapolis Royal, which has just put in guest moorings and a float at the wharf so even if the tide is down (all 26 feet) you can get ashore from a tender. There is a lot to see right in the town of AR and also public transit in about 50 – 60 miles in either direction. And I’d be happy to take you sightseeing if I still have a car. That would be such fun, to come see the area where you live. Will you stay in the same town, when you sell your house? Passamaquoddy Bay has been calling to me for years – I hope to actually get in there and see it sometime soon. I got to 3 miles from the entrance into Lubec, a couple of years ago, so getting closer! Thank you so much for the lovely invitation – town moorings and a float make it sound especially easy to come say hello! Yes, I am moving to another town, but that is only across the Annapolis River to Annapolis Royal, perhaps half a mile as the crow flies, and into the port town. I have swum across the river there and at my leisurely pace it took about 20 minutes; those who went with me wearing flippers were there in about 10 minutes. Similar to swimming from Cambridge to Boston somewhere near the Salt & Pepper bridge. That sounds fun – good luck with the move!